Our beloved planet is currently under siege thanks to greedy affluent societies that will go to any length to obtain coveted, shrinking resources. The very existence of our species is threatened by a host of potential scenarios, all vying to radically alter our way of life in the next decade. From global warming to nuclear confrontation to resource depletion, we are definitely on the edge of an abyss, a chasm we have created through our own lack of awareness of the effects our wasteful ways have had upon each other and the planet. Our current lifestyle is unsustainable, and very soon we will have to adapt to a completely different set of circumstances. The world will undergo a traumatic change and we will all be tested. Many will not survive this change, and those who do will be those who’ve prepared and are ready to adapt to the new scenario with the necessary survival skills. 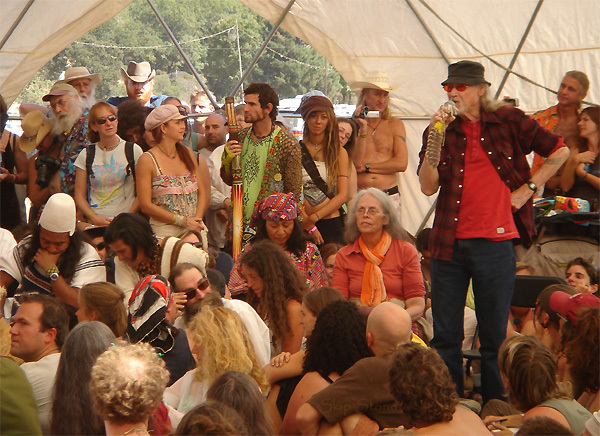 This is the message we heard from the Council of Elders at the EarthDance 2006. The Council was comprised of ambassadors from around the world, representing a wide range of ethnic, religious and social groups. 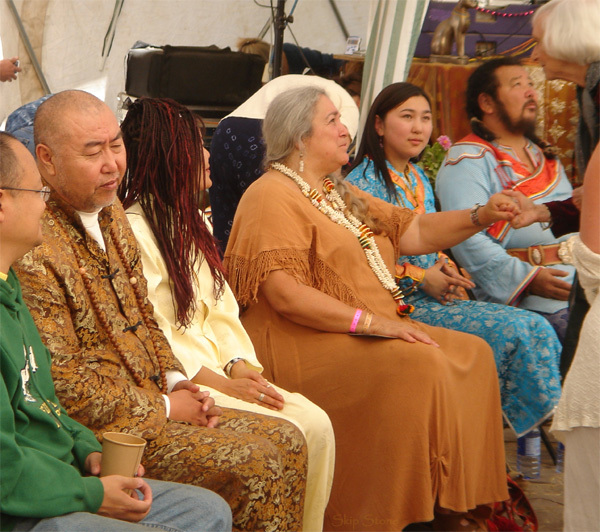 From a Mongolian shaman to a living Chinese Buddha to Wavy Gravy they spoke with one voice, declaring that now is the time for all good people to unite as one, to share their knowledge, prophecies and experience for the good of all. 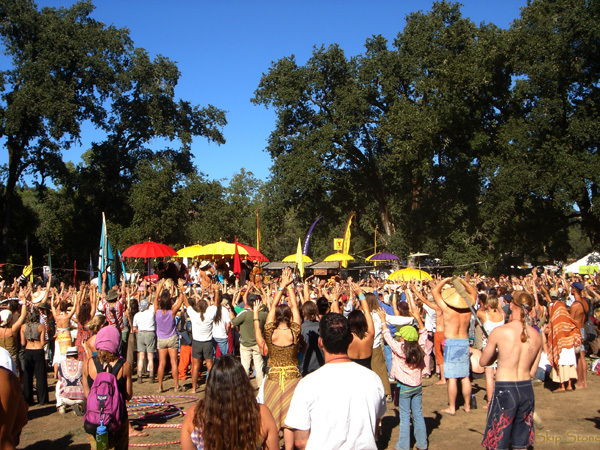 Earthdance is symbolic of a new renaissance of awareness that is sweeping around the globe. Everywhere people are waking up to the idea that we must unite in order to survive what is coming. 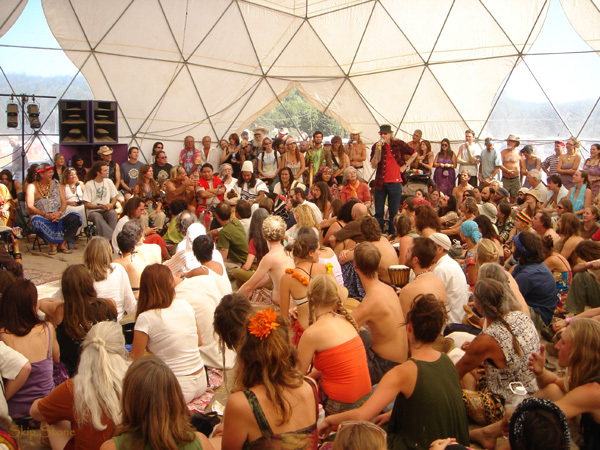 Indeed, Earthdance is a Global Festival for Peace, with people in 250 locations in 50 countries from Argentina to Zambia participating in the event. The highlights of the festival were the Council of Elders and the Prayer for Peace where the Elders gathered onstage to lead the prayer which was simultaneously occurring in those 250 locations and elsewhere around the world. It’s a challenge to describe what I experienced at those two events, but I’ll try. 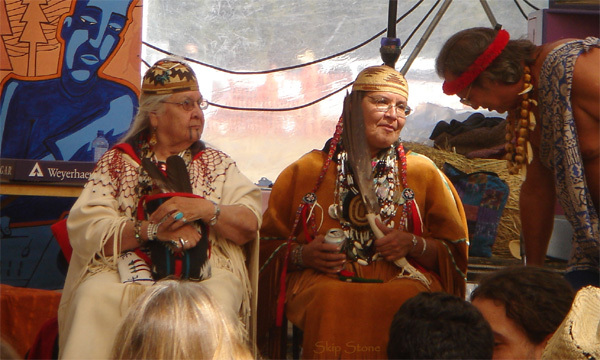 At the Council of Elders I was amazed at the semi-circle of gurus, shamans, tribal leaders and healers spread out in front of the audience. On my left were the likes of Swami Chaitanya, Living Buddha Master Yu, Zorigtbaatar Banzar, Mongolia's Chief shaman and Wavy Gravy. Off to the right were the people like St. Stephen Gaskin and his wife Ina May Gaskin, as well as Guatemalan and Colombian healers. Center stage included Native American Elders from across the country including the Iriquois, Siletz, Hawaiian and Seneca tribes. The Elders blessed those gathered before them, and each delivered a message of peace and unity, impressing upon us a certain urgency, as required by their teachings. It seems as each of the native prophecies come true, they are coming forward to share these prophecies with the world, warning us that time is growing short and we must come together as one soon if we are to survive. This is the most important message they all delivered. At one point during the council, we were asked to all hold hands and pray together. In the sweltering dome, we took our neighbors hands and prayed for peace. After about 20 seconds or so, I felt a sudden charge of energy pulse thru me, not unlike those I have felt at other such times. It was like the circuit was open and the energy was flowing. A nice peaceful feeling enveloped me and I relaxed. Feeling it was time to do my part, I opened my chakras up and let energy flow from the Source thru me to the gathering, as I’ve done many times before in similar situations. Within moments of doing that, I suddenly felt a huge jolt of energy, coming right at my head. I saw it as a burst of white light, which penetrated my being, lifting me up in a way I can’t describe. Then another burst came thru like the first, each burst lifting the energy exchange to a new, higher level. Then a third burst came in as powerful as the first two. All this happened in a matter of a few seconds. I'd never experienced anything like those jolts before. That experience taught me something important. That I’m not alone in what I’ve been feeling the past few years (decades actually), and that there is now a strong and growing network of very high people with the energy to change the world. Yes, we can do it now! But that experience was to be matched the next day at the World Prayer for Peace. The same Elders gathered on a special platform near the main stage and led the prayer. The crowd around me raised their hands in prayer. let us connect heart to heart. Through our diversity we recognize Unity. Through our compassion we recognize Peace. As the prayer ended, I experienced another mystical event. I felt and saw two circles (rings actually) of turquoise colored light burst from the platform and radiate outward to the crowd and beyond. They were like shockwaves, or ripples that radiate from a pond after a rock is tossed in it. But they moved fast and were gone in an instant. Once again I felt a wave of peace envelope me and lift me way higher than my cannabis induced high could ever reach. I wasn’t the only one who felt that. Everyone at the event felt it too, and even people far removed from Earthdance reported feeling a beautiful strong vibe at that moment. It seems the message of peace was sent and received. Everyone and Everything at Earthdance were focused not just on spreading the message of peace and having a good time, but on doing it right. From craftspeople to conscious musicians to the healing village, everyone brought something to share with others at the event. Volunteers helped sort recycling, keep traffic and people flowing and help people find what they needed. There was even a solar powered ATM machine at the event. The music was excellent for the most part. Groups from around the world kept everyone dancing with trance, reggae, rock, rap, funk, hip-hop and more. Four stages were going almost full-time with high energy or even meditative sounds. Ani DiFranco, India.Arie and Ozomatli were some of the more popular performers. 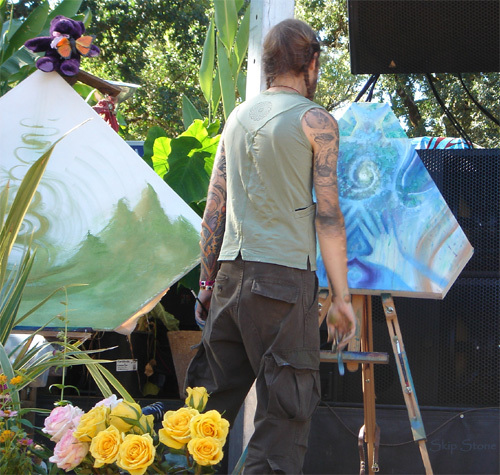 Various artists captured the energy of the music by creating spontaneous paintings on stage while the musicians performed. The speakers forum was blessed with an appearance by M.K. Gandhi’s grandson, Arun Gandhi who spoke of the need for world peace. Others spoke about Intentional Communities, sacred circles, kundalini dance and future gatherings. Storytellers shared traditional African, Native American, Mayan and Celtic stories at the Storytelling tipi. 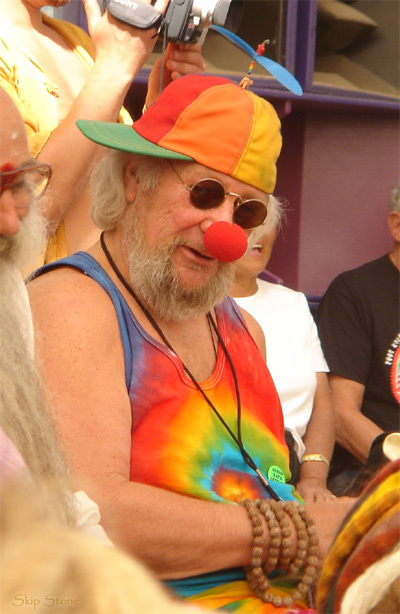 Wavy Gravy did a comedy show. Inspired movies played all night till dawn for insomniacs. The Healing Village offered just about every type of massage you can think of. The Lotus Temple was a place to meditate before an altar of your choice. 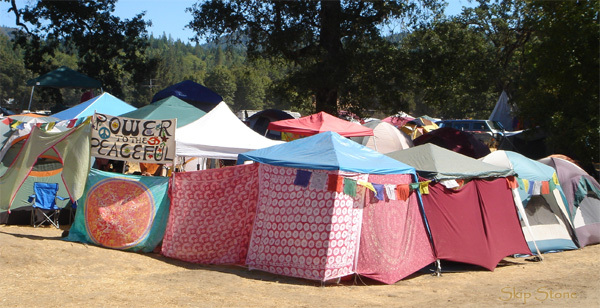 The attendees at Earthdance were a beautiful m�lange of old and young hippies. You were either in your twenties or fifties it seemed. You were either high on life or marijuana, mushrooms, LSD or E. There were a substantial number of drunks too, no doubt attracted by the hip-hop & rap performers on hand. Camping at the event is an experience in itself. 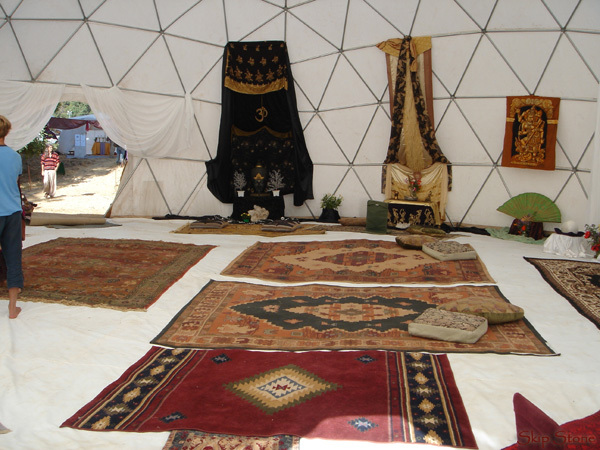 Many regulars at Earthdance create their own circles of tents and canopies. 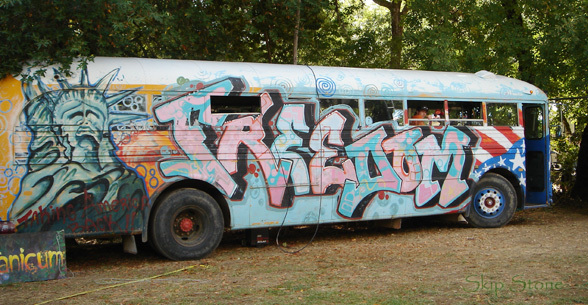 Others bring their brightly painted school buses. Because this Earthdance was a sellout the “sanitary” facilities were overtaxed despite the best efforts of the crew to keep things clean. The weather can be surprising as the first night we had an unexpected rain and frost, and many were caught unprepared for the cold. By the next day the temps were back into the mid 80s and many went skinny-dipping in the clear river to cool off. 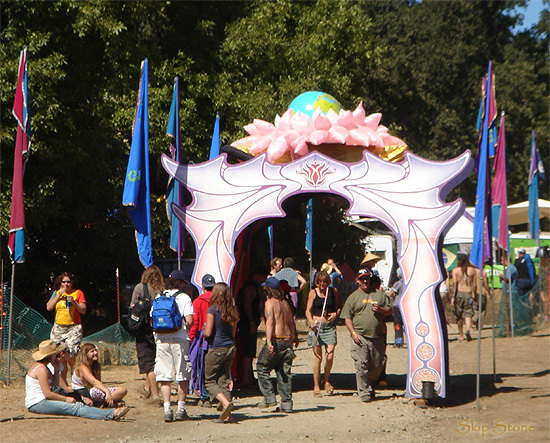 Earthdance 2006 was a joyful, danceful, memorable experience that I'm sure enlightened many and changed lives. I'm already planning for next years' event! You can view more pix from Earthdance in my gallery.